A little bit tart, a little bit sweet and a lot delicious. This cookie recipe started as many things do, with what I had leftover in my cabinets. A friend had given us a tub of dried cranberries and I had half a bag of white chocolate chips leftover from when I was experimenting with Paul Hollywood’s Chocolate Cherry Loaf. To die for, by the way, but I need to work on shaping the dough. Even though I adore the texture of crispy cookies, I can still appreciate a good soft cookie and these definitely fit that bill. I’ll likely make a crispy version of them down the road, just to have another cookie to debate with my husband over, 😉 but these are definitely a winner as-is. You know you’ve got a good cookie recipe when you eat one, just as a taste test, and thirty seconds later you can’t help but go back for a second. That’s exactly what happened with these by the time I had tweaked the recipe for the third time. It reminds me of The Great British Baking Show when Mary Berry and Paul Hollywood are tasting dozens of dishes to critique them. If they go in for a second bite, you know it’s a “star baker” quality recipe. I’ve been so enamored with cakes and pies lately that I’ve just realized this is the first cookie recipe I’ve posted! That seems crazy to me, but there is so much more of everything to come! I’m really excited to look back at all of my posts in a year or so and see all of the recipes and projects I’ve complied. I can’t tell you how many times my husband has said something like “Remember those (random dessert item) you made forever ago? You should make those again.” and then I have no idea what he’s talking about. Thanks to the handy intranets, we should never have that problem again! Where oh where will the road of dessert adventures take us next? 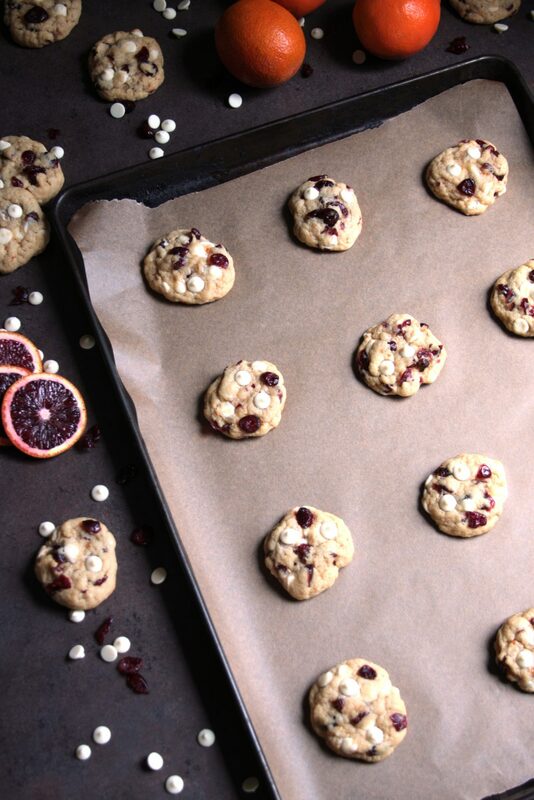 Perfectly soft and loaded with tart cranberries, Minneola tangelo zest and sweet white chocolate. They are even better (and softer) on day two after all of the flavors have had time to mingle. 170 grams salted butter 3/4 cup, if you're adamant about using unsalted, add an extra 1/2 tsp of salt to the recipe. 1 medium Minneola tangelo you could also use a blood orange*, two clementines or a small orange. 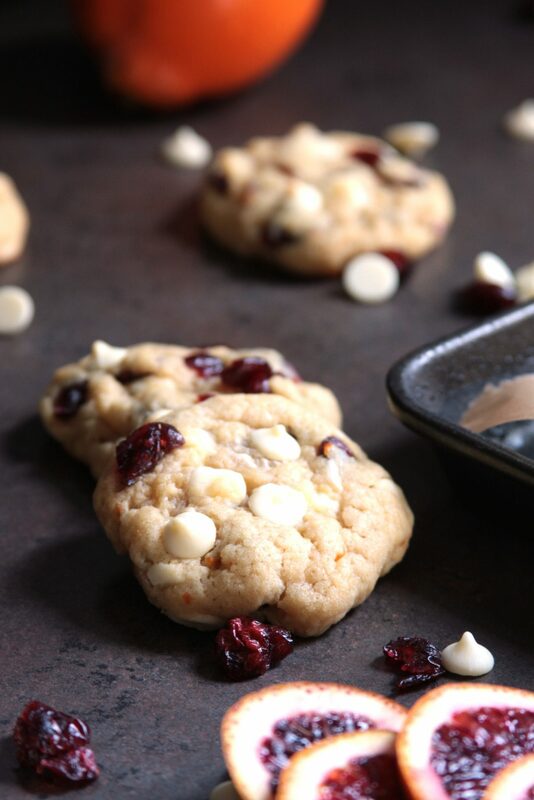 100 grams white chocolate chips just over 1/2 cup, plus more to press into tops of cookies. 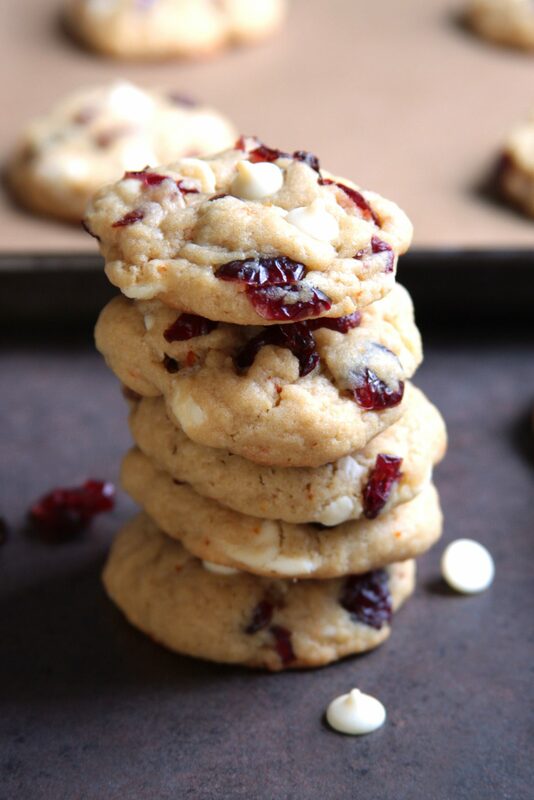 100 grams dried cranberries about 3/4 cup, plus more to press into tops of cookies. Melt the butter in a sauce pan over medium heat. Once melted, remove from heat and add the vanilla and juice from the Minneola/clementine/orange. In a separate bowl, add sugars and zest from the Minneola/clementine/orange. With your fingers, rub the zest into the sugars until fragrant. Add flour, cornstarch, baking soda, salt and egg to sugar mixture and whisk until evenly combined. The egg just needs to be worked in enough so it won't scramble when you add the hot butter. Add the melted butter mixture to the sugar mixture and mix until well combined. 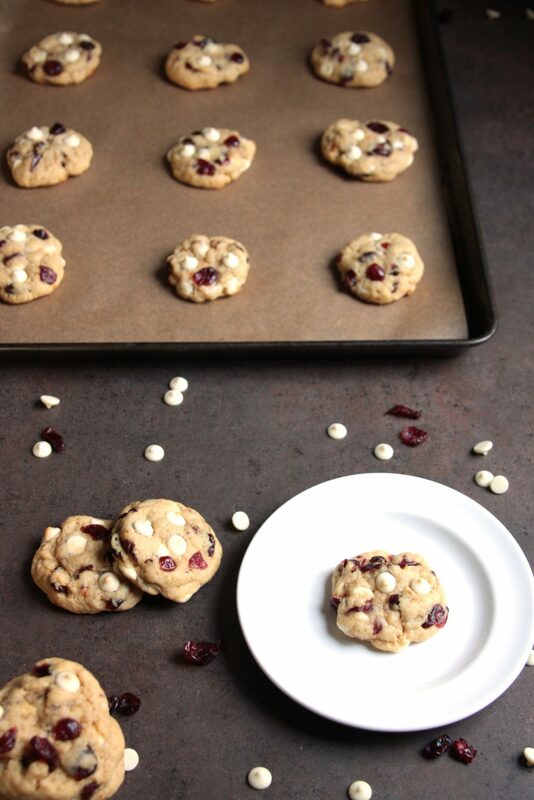 Add dried cranberries and white chocolate chips and mix again, until well combined. Cover and refrigerate for at least 3 hours or until dough is very stiff. You cannot skip the refrigeration step but they can be refrigerated overnight. Preheat oven to 325 degrees. Set oven rack one level below the middle. The white chocolate chips tend to brown during the last few minutes of baking if you don't give the tops a little extra room. Use a cookie scoop** or spoon to scoop out about 1.5 tablespoons or 40 grams worth of dough. Roll the dough into a ball between your palms, place it "pretty side" up on a parchment lined cookie sheet, then slightly flatten the ball by pressing down on it with the palm of your hand. Cookies will spread slightly so leave at least an inch or two between cookies. It's not imperative that you roll them between your hands, you could just use the cookie scoop and be done with it but the warmth of your hands smooths out the dough and makes them look a bit nicer. 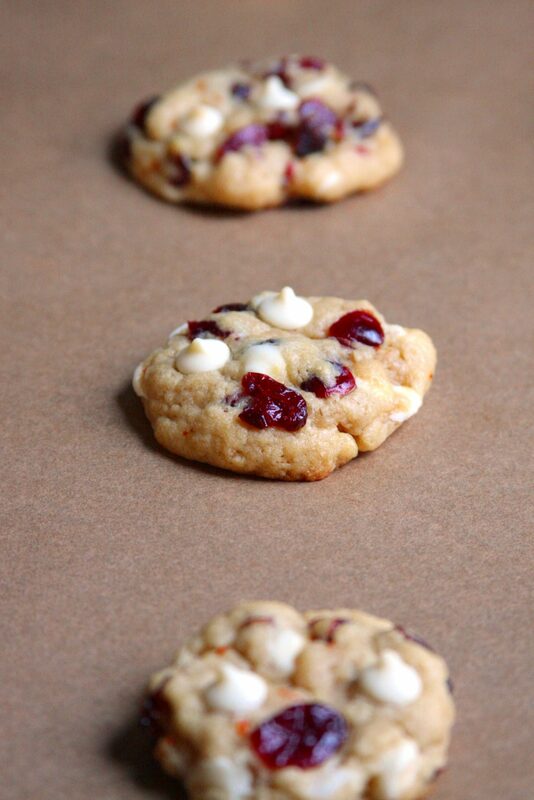 Press extra dried cranberries and white chocolate chips into the top of each cookie to pretty them up a bit. Bake 10-12 minutes or until edges have just set and bottoms are golden brown. Centers may look slightly underdone. Leave the cookies on the cookie sheet for 10 minutes so they can slowly finish cooking and the pan can cool completely. Then move cookies to a cooling rack and start the next batch of cookies once the pan in completely cool. ** A cookie scoop makes quick work of making sure each cookie is the same size and makes it easier to deal with very cold, stiff dough. Inspired by Sally's Baking Addiction and Del's Cooking Twist. Do you prefer soft or crispy cookies? Original or chewy Chips Ahoy? What is your favorite cookie flavor? Comment below!